2-way design with separate compression and rebound adjustments. choice of 3 different linear spring rate kits: 500 lbs/400 lbs(9kg/7kg), 400 lbs/350 lbs (7kg/6kg), and 350 lbs/300 lbs (6kg/5kg). stainless steel corrosion resistant coating. limited lifetime warranty through KW. wide range of spring rates supported without a revalve. I placed my pre-purchase order with RCE in December 2006 for the 350 lbs/300 lbs (6kg/5kg) rates. I chose the 350/300 rates because my car is my main transportation to work. It is a track car secondary. I also live in Los Angeles where the roads are poorly maintained and constructed (the 405 washboard). Finally in February 2007, they arrived. I had some issues with the packaging. When I picked it up from my mailroom, the entire box was taped up with “Inspected by DHL” tape. There was a hole in the box where the front coilover lower attachment point was. I can only think that DHL opened the box to inspect the coilovers for damage and then taped it back up. The piggy back reservoirs for the front struts had no protection from the sides of the box. If the box was dropped on its side, damage may of occurred. I inspected the coilover and there were no bends or cracks so I was satisfied at the moment. I was actually surprised that the coilovers were not damaged in some way due to the lack of protection. The instructions that were included stressed that the coilovers be installed by a professional. Sounds primarily like a disclaimer. If you have a copy of the service manual for your car and have the tools (and know how to use them), the installation should go smoothly. The Tarmac 2 uses linear springs in the rear and therefore required modified Group N mounts. RCE sells these mounts along with their own rear pillowball mount. The Tarmac 2 may work with other brands of camber plates but you may have to check with RCE first. Since I already had Group N mounts, I opted to modify them so they work with the Tarmac 2’s. The PDF they sent me on how to do it looked easy enough. I purchased a 4″ electric grinder with cutting wheels. My first attempt was pretty sloppy and did not look as clean as the instructions they sent. On the second mount, I cut slots (with the cutting wheel) into the part that needed to be removed and took pliers to fatigue it (work it back and forth) to break free. I did this all around. This looked better than my first mount. I sprayed both of them with black spray paint to cover the raw metal exposed after removing the part. I reused my PDE adjustable camber plates for the front. I could not use the supplied nylock nut and washer due to the design of the pillowball in the camber plate. There was enough threads on the coilover for the PDE nut to screw on without any problems. Height adjustments were easy by moving the lower perches. They were made of some kind of plastic and thought they were metal. The set screws on the lower perches were sometimes a pain to access with the allen wrench if the screw was located behind the coilover. The front passenger coilover lower mount hole for the camber bolt was opposite from the stock struts, from the front towards the rear, with the nut on the rear side. This is just a minor detail since camber is still adjustable. The rear struts have the top hole slotted in the lower mounting point. This is to provide rear camber adjustment. I had a Ingalls camber bolt on my stock strut and it had a lot of play when I used it with the Tarmac 2. I wish I had my stock bolts still. After a basic wheel alignment on Sunday, I was ready for a test drive. Test Drive – Streets of L.A.
RCE had adjusted the compression and rebound to the spring rates I had for street. They were real close to my ideal ride. I will probably adjust the rebound a tad slower to my liking. The first thing I noticed was that I was no longer driving a bucking bronco. There is no harshness on the rebound anymore like my stock struts had. The Tarmac 2’s soaked up the bumps of the poorly maintained L.A. roads easily. I drove on streets I always used and could already feel the difference between my old spring and stock strut setup to coilovers. The occasional “squish” sound would occur from the rear coilovers in the cabin which was not annoying at all. Quick flicks of the steering wheel showed little body roll. I had a track day on the following Monday at Streets of Willow. I was not going to drive hard like I usually do at this track (so no lap timing). This was a new suspension setup for me and I did not get a full alignment with corner balancing yet. The compression and rebound settings were left unchanged (out of the box) to see how they handled on the track. The first half of the day it rained hard. Since this was my second wet track day, I took it easy. I left my street Bridgestone S0-3 tires on the car. Cornering was definitely more flat. There was not much rolling compared to my old setup. Turn in was sharp. The sun came out in the afternoon and dried the track up by the lunch break. I decided to install my Nitto NT-01 R compound tires. The grip was excellent on the track. No more floating sensation after hitting the undulations in the track. It felt more planted. I hit the red and white berms at speed to see if it upset the car. The car just floated over them. In the bowl, a positive camber right turn, the car felt neutral when under full throttle. There was little dive during hard braking. There is so much more potential I can get out of these coilovers once I get them corner balanced, realigned to better specs, and adjust the compression and rebound to track. The Racecomp Engineering Tarmac 2 coilovers in 350/300 is a great setup for the car that does mostly daily commuting (and takes passengers) and the once a month track day. You can have a sport luxury car ride when you commute and then adjust the rebound and compression for track. My commute comfort has improved a lot. I actually do not dread certain portions of my route anymore. I still have to get used to the great cornering. It feels almost like a regular suspension car over speed bumps in the parking lot. I had my girlfriend ride in the passenger seat and she says it is so much better than before. To recap, I had the Tanabe GF210 springs on stock struts. I got corner balanced and a wheel alignment at West End Alignment. This shop does a lot of race car suspension work. Darin Nishimura, the owner and tech, stated that the rear strut should not have the slotted top hole at the bottom mounting point. A strong bump can put the camber setting out of whack. He suggested that they should be regular circle holes (like OEM) and a aftermarket camber bolt should be used. Another solution is to not slot that top hole too much so that there is around a -2.0 camber available with non adjustable top mounts and no positive adjustment. He worked on a lot of cars with KW suspensions. One day he was contacted by KW U.S.A. and spoke to their engineer about the drawbacks of the rear hole being slotted. I guess they never took his advice. I had a Ingalls camber bolts in the rear before. He now has to replace it with a stock straight bolt. The stock bolt will just hold the camber settings with clamping force only. Though he only personally heard of one “camber slippage” occurrence about three years ago. It is rare but possible. Darin recommended relocating the battery from the front left corner (1040 lbs) to the trunk but in front of the rear axle (rear right 670 lbs.). This would balance the car better. Also a light racing seat would help with the left to right (51.4% to 48.6%) balance. I am reluctant to lose my side airbag due to this being my street car, removing safety, and possible insurance reasons. So it looks like the battery relocation is my next mod! The car feels planted better in the rear under acceleration in the corner. Less twitchy. Maybe because my initial alignment was over -2.3 camber in the rear. I will have another update after my track day at Buttonwillow on April 8. This time on track settings! Removed trunk carpet, spare wheel cover, and jack. Had street wheels (Work Emotion CR) and full interior installed. I had a track day on Easter Sunday and I wanted to see how the car felt with track settings. The track was Buttonwillow in Buttonwillow, California. The configuration was #13 in a clockwise direction (first time I drove this config). I set the coilovers to the track settings recommended by Racecomp Engineering. The car felt loose at first but was fixed by adjusting the rear tire pressures. I got the feel for the setup in the first two sessions. In the third and fourth session I felt really comfortable with the settings. I did not change any coilover settings during the day. Tire wear seemed to wear more evenly. The outer edges of the front tires usually suffered from excessive wear with my old setup. Occasionally I would hit the berms in the esses and the car did not feel it was upset a lot. I managed a best lap time of 2:09 where average was about 2:14-ish that day. A friend (Garry) who also had Tarmac 2 coilovers but with the stiffest spring set (500/400) accomplished a 2:07 lap time. This was also his first time in this track layout. He liked the coilovers and felt the car was neutral. My car seemed to get loose on corner exit under full throttle. It may have to do with my rear sway bar being too stiff even though it is on the softest setting. I have the Hotchkis Competition model. Chris advised me to try and make the rear softer a bit. I adjusted the rear compression a half turn more softer than the recommended Racecomp settings. This seemed to fix the oversteer. The car feels more neutral and inspired more confidence in driving. Another benefit was that the comfort has improved and road imperfections are smoothed out more. Racecomp Engineering will be set up by September 2010 to perform rebuilds on its Tarmac 2 coilovers. Price will be $85.00 per corner. 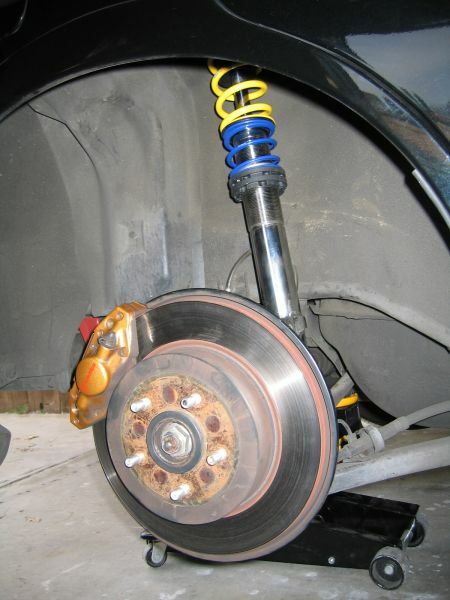 It is recommended that the Tarmac 2 coilovers be rebuilt every 48 months. I purchased them at an introductory price directly from Racecomp. I will update the blog with the current retail price.